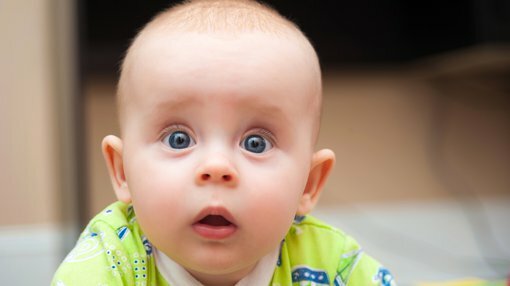 Stock of the week, Baby Bunting Group Ltd (ASX:BBN), comes from the beaten down S&P/ASX 200 Consumer Discretionary sector (XDJ), and as such, could be considered a contrarian investment. However, before making that judgement, it is worth examining the sector performance, fleshing out the dynamics that have driven the XDJ lower and pointing out some differentiating aspects between companies in the sector given that they appear to have mistakenly been given the broadbrush. Also of interest is some recent activity that could signal a sector revival which may see a reversal of recent trends with a rising tide lifting all boats. In Baby Bunting’s case, it could receive a significant boost with the consensus share price target implying upside of approximately 30% from current levels, with the other impetus being the release of a very positive trading update this week. Analysts at Morgans pointed out this week that Baby Bunting is the clear market leader in its field, and with the scope to increase its store numbers by 60%, there are multiple growth drivers. Why is the broader sector underperforming? The consumer discretionary sector is driven by consumer spending activity predominantly in relation to non-essential items such as groceries and fuel. The sector is home to companies such as Nick Scali (ASX:NCK — furniture), Super Retail Group (ASX:SUL — leisure, sporting and recreation), Webjet (ASX:WEB — travel), Breville Group (ASX:BRG — electrical appliances) and ARB Corporation (ASX:ARB — motor vehicle equipment). When consumers are seen to have higher levels of savings and disposable income, as well as manageable levels of debt, there is generally support for the sector, given the robust purchasing power and the freedom to spend. Obviously, when the financial position of consumers is at the opposite end of the spectrum, negative sentiment normally sets in. Talk of increasing interest rates, a tightening in lending policy as a result of the Royal Commission, and a slowing in the housing market are issues that have taken their toll on the sector. Interestingly, interest rates are yet to increase, money is still available to borrowers who have the earnings capacity and appropriate asset backing, and in many states, the housing market has remained relatively stable. Consequently, one needs to be cautious in attributing too much negative sentiment to these issues at this stage in the cycle. In the retail space, the other elephant in the room over the last two to three years is the loss in market share from bricks and mortar retailers as consumers choose to shop online. It could be argued that this was more of an issue a few years ago when bricks and mortar retailers were blindsided by the e-commerce impact. In recent years, most retailers that tended to be prone to competition from the online sector have established omni-channel platforms that allow customers to purchase in-store or online. We probably saw the first sign of pressure being exerted by e-commerce on bricks and mortar retailers in 2015, and this triggered some shock waves with the XDJ falling roughly 15% from about 2000 points to 1700 points. 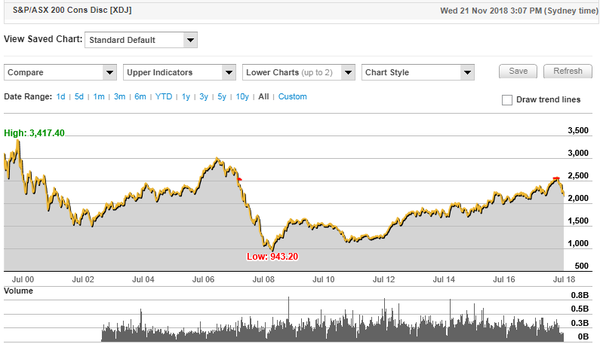 As investors gained an understanding that this wasn’t Armageddon for the traditional retailing model, confidence was restored and the sector went on to rally approximately 1000 points between August 2015 and August 2018 when the index touched above 2600 points for the first time since January 2008. There was no Armageddon for traditional retailing. The fact that this recent downturn occurred at the end of August isn’t coincidental as there were some significant underperformances by retailers during reporting season. However, plenty of retailers delivered better than expected results, and the post-reporting season sell-off appears to be more a case of dwelling on the underperformers. It is easy to fall into a pattern of focusing on negatives when there are other troubling factors at play, and with global equity markets rocked in October, an 150 point retracement morphed into a 350 point plunge. Despite a slight recovery in early September, the index has fallen close to 100 points since the end of October, and it was only on Wednesday that the XDJ hit a 12-month low of 2148 points. However, when it comes to weighing up Baby Bunting’s investment merits, it’s not the extent of the falls, but the underlying reasons that count. In short, the market has been spooked by global volatility and some isolated poor performances by certain companies in the index that aren’t in related industry sectors to Baby Bunting, as well as yet to be proven assumptions regarding the Australian economy. With all this noise and innuendo, the beauty of domestic retailers is that they are rarely affected by issues such as Trump tweets, spats between the US and Mexico, and the UK’s ability to manage Brexit. And for a company such as Baby Bunting, a retailer of essential baby and children’s products in the local Australian market, it is hard to see global issues playing a significant role in its future. Population growth is a natural driver and, as we will illustrate, the company has a number of levers to pull in terms of extracting additional growth from the business. The other reason why the timing appears right in terms of identifying value in the retail sector is that there are some signals emerging which normally indicate sentiment is poised to turn. Whether it be the mining, healthcare or retail sectors, the commencement of corporate activity is effectively a recognition by big investors that there is value in the sector. Only this week, Allensford Pty Ltd, in its capacity as trustee of the Allensford Unit Trust, made an unconditional on-market cash offer of $2.70 per share for all of the ordinary shares of The Reject Shop Limited (ASX:TRS) that it does not already own. This comes approximately a month after The Reject Shop issued a sizeable profit downgrade, which came on the back of a disappointing fiscal 2018 result in August. The company’s shares had slumped from $8.36 in April to a low of $2.00 in early November. The offer price of $2.70 cash per share represents a 35% premium to the November low and a 19% premium to the 1-month volume weighted average price (VWAP) to 20 November 2018 of $2.27 per share. Allensford Unit Trust are wholly owned by Bennamon Pty Ltd, which in turn is wholly owned by Kin Group Pty Ltd, a diversified, global, long-term-focused investor ultimately controlled by the Geminder family with offices in Melbourne, Australia and New York City, USA. Consequently, this is a material bid by a very experienced investor in the retail space, and, as such, its value judgement carries plenty of credibility. There has also been corporate activity in the non-discretionary consumer sector with the demerger of Coles from the Wesfarmers Group, and it traded strongly on debut despite negative market conditions. In fact, the high of more than $13.00 was at the top end of analyst valuations, which were in a range between $11.00 and $14.20. There would be few companies in the XDJ which go closer to being a non-discretionary retail stock than Baby Bunting. The company sells products that are ‘must have’ items, particularly for babies and toddlers. Equipment such as prams, walkers, safety capsules and baby seats for safe travel are essential items. Then there is the emergence of high-tech items such as monitors that can be placed in the nursery which help parents to feel easier about their child’s welfare when sleeping. High-tech products have emerged to boost Baby Bunting's bottom line. Much of the clothing also falls into the 'essential' categories, while other areas tend to be fairly resilient even during periods of tighter spending. From a retailer’s perspective, the good thing about children’s clothing is that they grow out of it every year. Children are generally the last ones to feel the pinch when family budgets are tweaked. 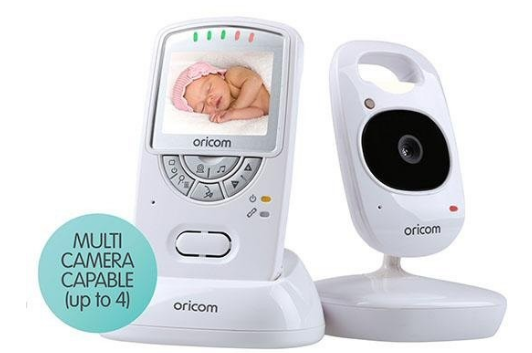 Importantly, many of the company’s bigger ticket items such as prams and baby seats don’t lend themselves to online buying as parents want to check the features, as well as gaining an understanding of the product. The prams of today, for example, have more moving parts than a space shuttle, and in making those adjustment points difficult for children to access, they also make them a minefield for the uneducated to negotiate. Prams seem to have more moving parts than space shuttles. That said, the company hasn’t buried its head in the sand and made the assumption that it is insulated against online buying. In fiscal 2018, online sales were up 63% compared with fiscal 2017 and accounted for 9.5% of total sales. Indeed, there are certain products that are easily obtained online, and one of the company’s key priorities in terms of its growth strategy is to continually expand and improve its online capabilities. 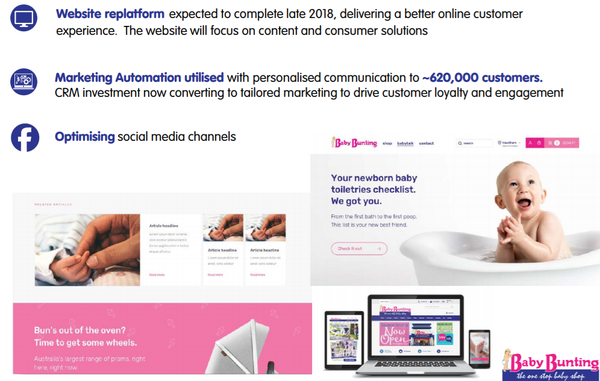 Baby Bunting is improving its digital growth strategy. Baby Bunting is also well-placed to harness growth by expanding its store network. The company had 47 stores as at June 30, 2018, and since then it has added another three stores, with at least four more in the pipeline for late 2018/2019. Management is targeting an 80 store network which represents a 60% increase, indicating the strong incremental growth that should occur by simply replicating its successful business model over the coming years. BNB is expanding its store network. Not only will this generate additional revenue streams, but it will also provide economies of scale as the company benefits from improved buying power and supply chain efficiencies. As well as generating additional income from new stores, it is important for retailers to grow earnings from their established outlets as there comes a time when the network moves towards full capacity that this will be a more prominent growth driver than store expansion. Performance of established stores is referred to as comparable store sales growth, and the company has made a strong start to fiscal 2018 with this measure showing growth of 9.6% in the period to November 15, 2018. Importantly, this doesn’t include the traditionally busy Christmas period where non-discretionary spending on gift type products provides revenue momentum. It is important to note that five of Baby Bunting’s competitors with combined sales of about $140 million closed between September 2017 and August 2018, positioning the company with better pricing power as this year unfolds. Competitor closures are working in BBN's favour. Closures included Toys R Us, Babies R Us, Bubs and Baby Bounce with a total of 70 stores throughout all Australian states except Tasmania. Some of these stores had ‘fire sale’ closures with heavy discounting placing substantial pressure on Baby Bunting. In the absence of these headwinds, the company should achieve improved margins in fiscal 2019, and this is already evident with margins to date on track to meet management’s guidance of more than 34% in fiscal 2019. Consensus forecasts for fiscal years 2019 and 2020 indicate that the company will achieve earnings per share of 11.2 cents and 14.5 cents respectively. This would represent year-on-year earnings per share growth of 46.9% and 29.5% respectively. Based on these forecasts, Baby Bunting is trading on PE multiples of 18.9 and 14.6 respectively, which is deemed conservative for a company with such a strong growth profile. The consensus share price target is $2.75 implying upside of 62 cents per share, or 30% relative to Wednesday’s closing price of $2.13. Josephine Little from Morgans has an add recommendation on the stock with a price target of $2.78. In highlighting the company’s promising growth potential and defensive qualities, Little said: “We maintain an ‘Add’ rating and it is our view that BBN is now very well placed to take market share post the material wave of consolidation in FY18. “This market share opportunity, combined with what is a more defensive consumer and a strong earnings growth profile, justifies the premium valuation, in our view.